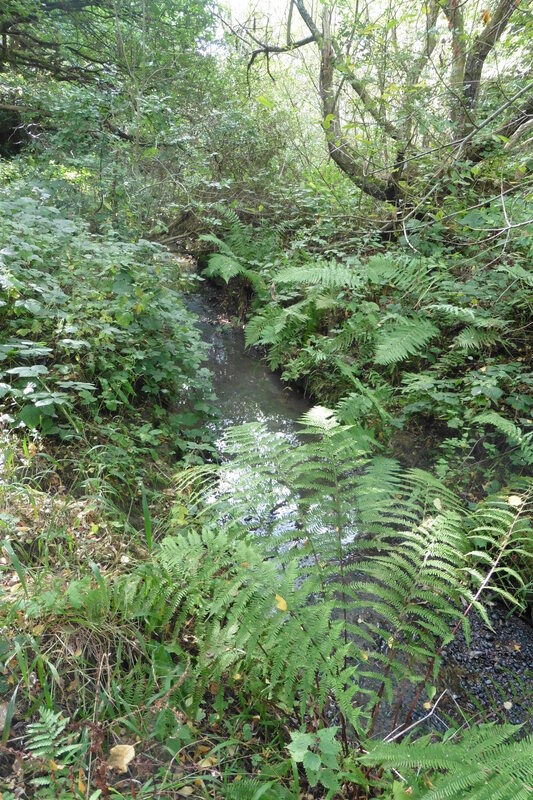 The relatively high area around Keston and Locksbottom is the source for dozens of springs and small waterways feeding the Rivers Cray, Ravensbourne and the Quaggy, itself a tributary of the Ravensbourne, although around here it is known as Kyd Brook – not to be confused with the Upper, Middle and Lower Kid Brooks which are a trio of tributaries entering much further downstream. The sources of the Kyd Brook are rather confused and, due to strictly enforced private land ownership, hidden from public view. There are two main sources – an easterly branch and a westerly counterpart – this post follows them to their confluence. The easterly source appears to be a spring in private land which, from current OS maps seems have been dammed to form private lakes post-World War 2 (they didn’t exist in pre WW2 maps). They are invisible to all but the cartographically literate (and the owners) – the very dense hedge is as near as it gets in terms of viewing the source. The course is easy to follow beyond the A21, the land slopes away gently northwards; modern maps indicate sections of the young river may be visible in the back gardens of Bassetts Way and Hilda Vale Road but, alas, not to the suburban explorer. 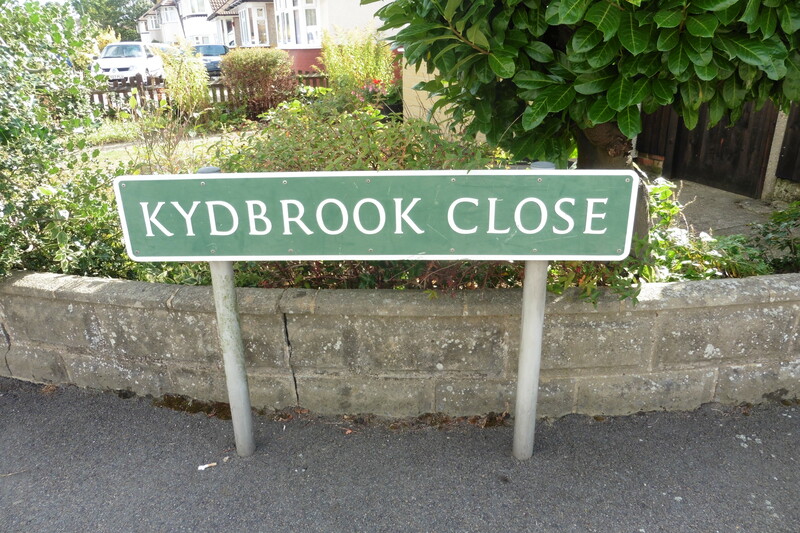 Bromley Council records suggest that the culverting of the Kyd Brook at this point seems to have been done without the prior permission of the local authority in the early 1930s when Hilda Vale was developed (1). There was also a pump around this point as late as the 1940s, taking advantage of the plentiful supply of ground water in the area. There is a small notch in Starts Hill Road where the river would have once flowed; progress following Kyd Brook downstream is blocked by allotments, but it is there where the eastern route emerges once more into the open. On a Friday morning, despite the warm autumnal sun, the allotment holders were absent, so the earliest view was the river emerging onto the eastern edge of the delightfully named Tugmutton Common (also known by the far more prosaic Farnborough Recreation Ground). Kyd Brook hugs the edge of the park, it is possible to follow it for a while – the river squeezes between the back gardens of Lovibonds Avenue and Grasmere Gardens before disappearing from view just beyond Lovibonds Avenue Screen which stops debris entering and blocking the culvert. It wasn’t always thus, until post-war development the river was above ground, as the map surveyed in 1948 shows. There seems to be another small tributary rising somewhere around Darrick Wood, it is clear on OS maps, I vaguely remember this from running an old route of the Orpington 10k, but I didn’t re-investigate on the ground. It joins before the eastern branch traverses Crofton Road. Beyond Crofton Road, the river enters the delightful woodland of Crofton Heath, it cuts a small valley through the (just) turning trees – several wagtails were enjoying the dappled sunlight, alas, my shutter finger was not quick enough to capture them. 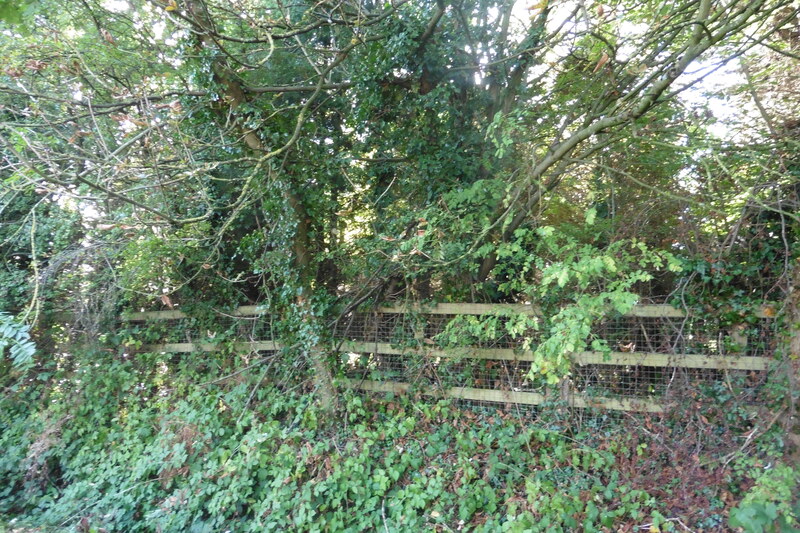 The river eventually emerges from the woodland and skirts fields with horses, the dividing fence with several encouragements not to feed them, before it disappears from view at another ‘screen’ on the descent into Petts Wood. The westerly source is a few hundred metres away in Ninehams Wood, this too is out of bounds, but the owners here are a little less subtle about keeping out the fluvial flâneur – a mixture of razor wire and threatening signage every few metres along the public right of way that skirts the woodland. There probably wouldn’t have been that much to see though had I been brave enough to ignore the warning – there was little sign of water in one of the driest Septembers on record. There was a dip in the path with a small gully and ‘screen’ which to stop debris entering the pipe that would take Kyd Brook northwards. 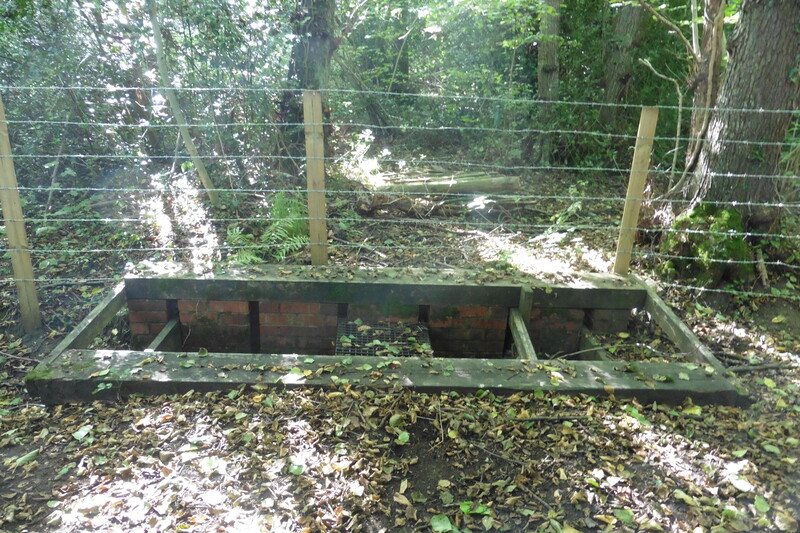 Even following a right of way parallel to the nascent Quaggy proved harder than expected – there was a massive wooden gate to the private estate which proved hard to open and one of the locals seemed reluctant to accept that there was a public right of way through the opulent modern pastiches of architectural styles past. Back in the civilisation of the A21, the course was clear to see, there is a clear dip in the road adjacent to Ye Olde Whyte Lyon. While there was no evidence of water – it was there in the past as an old postcard shows (Source – eBay Feb 2016). It would then have crossed the current Princess Royal Hospital site. Like many current hospitals, it had its origins as a workhouse. It goes back to 1844 and there is much more on the site at the Bromley page of the workhouses website, before later becoming the Farnborough Hospital. The site was re-branded and rebuilt as part of the disastrous Private Finance Initiative scheme of 2003, its financial difficulties nearly led to the partial closure of another hospital within the wider Ravensbourne catchment – my local one, Lewisham. 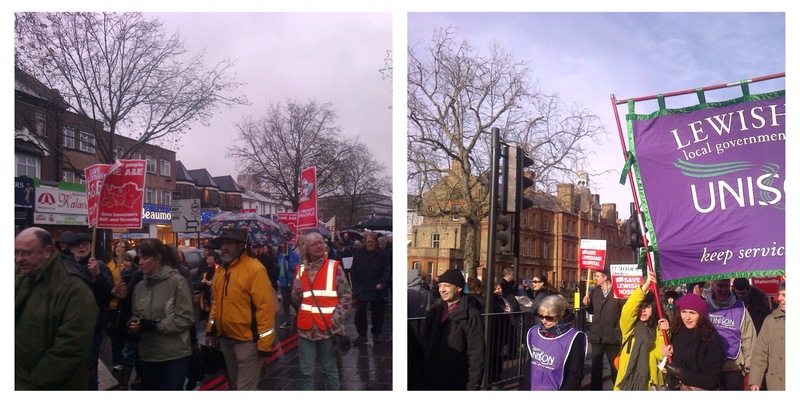 Although after protests and legal action, the closure of A&E and partial closure of the maternity section were prevented. 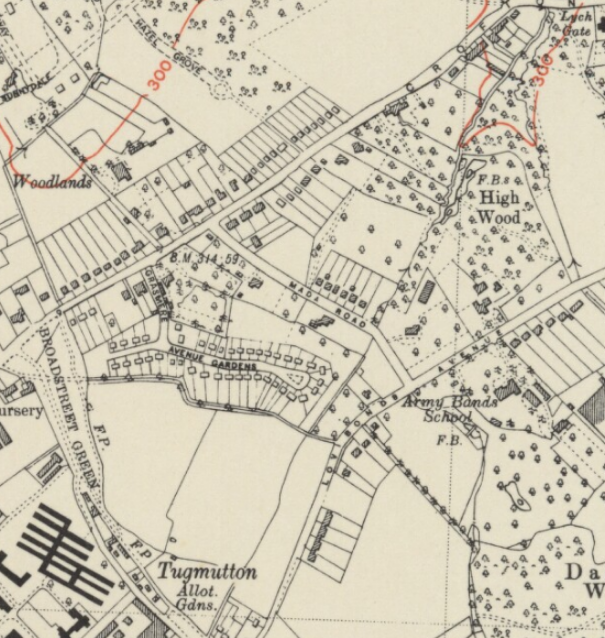 A couple of hundred metres along the road towards Orpington, a clear course for the young river appears on Tugmutton Common, marked on older OS maps as Broadstreet Green (see above), although it isn’t even damp to the touch; maybe there is a flow in wetter conditions though. 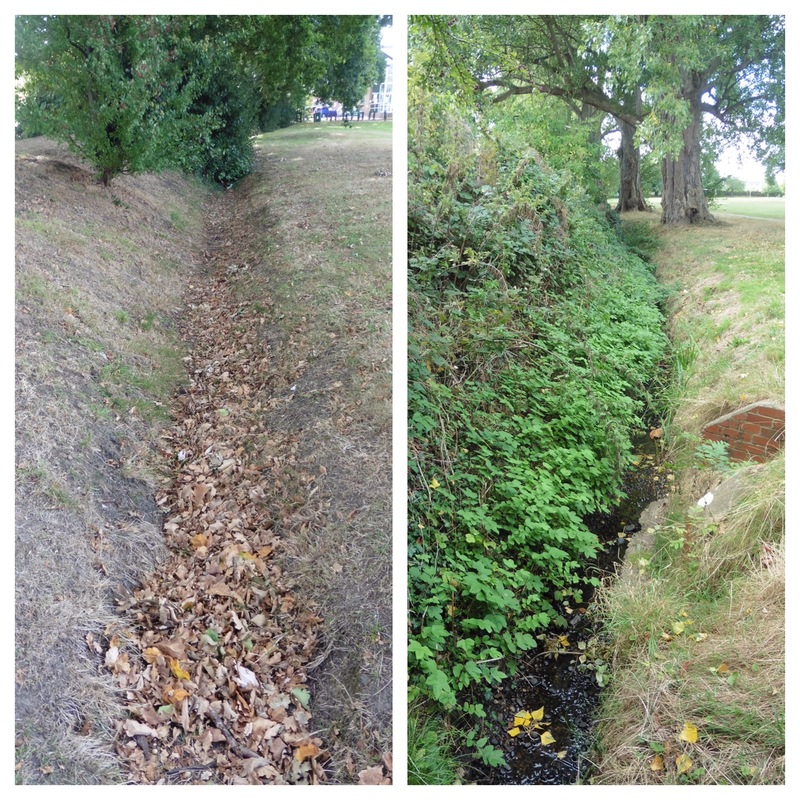 There is another ditch at right angles to Crofton Road, there is water in this, although not much, and while the ditch continues, meandering alongside the edge of the common oddly to the base of a tree, but the water peters out quite quickly. The junction between the two is made underground, but the combined source emerges out into the open on the opposite side of Crofton Road, hugging a narrow space between gardens. The river enters Crofton Heath and flows initially more or less parallel to its eastern sibling, although there is less of a valley and the path alongside it is much less well defined. It slowly comes closer and it too is culverted under suburbia, with a cul-de-sac taking its name. The confluence between the two branches is close by – near the junction of Ryecroft Road and Kenilworth Road. 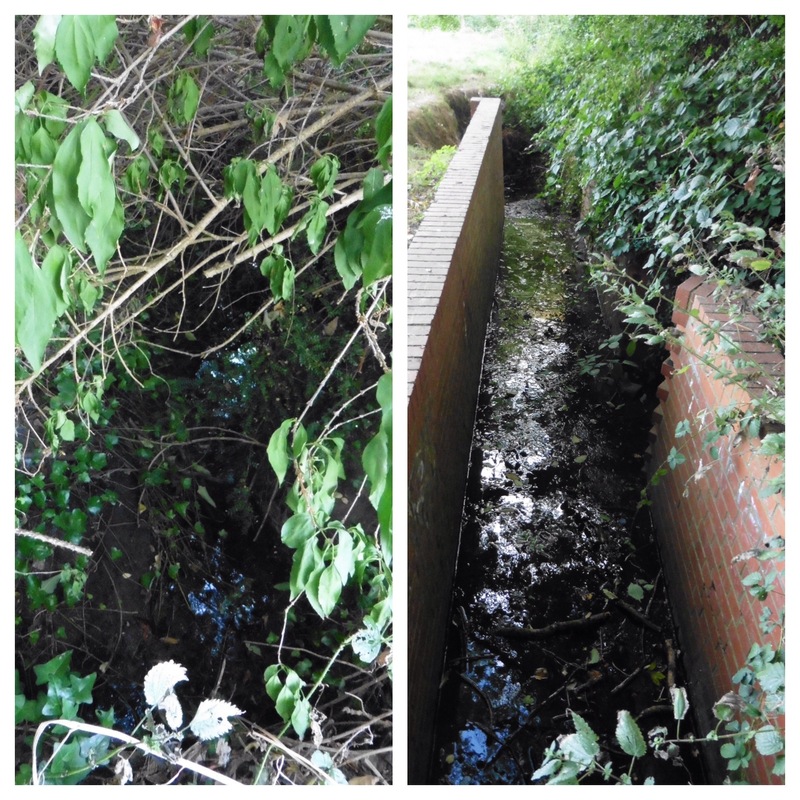 The valley of the combined Kyd Brook is clear a few metres further downstream as Ryecroft Road meets Queensway. 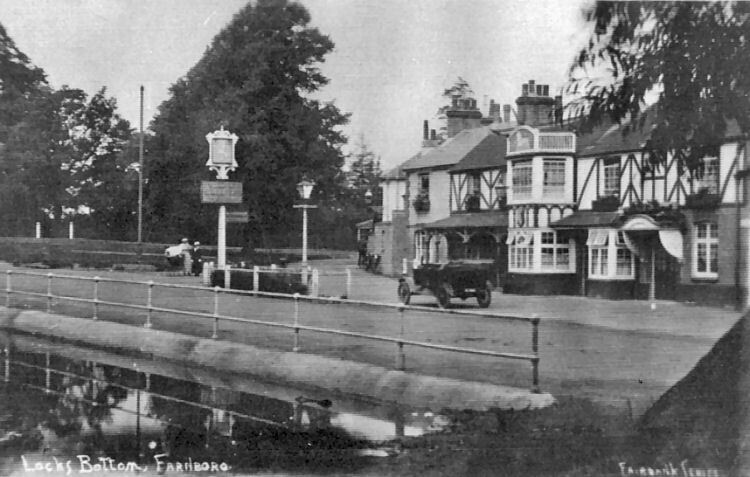 The journey downstream through Petts Wood and Chislehurst continues here. The source for this is an e mail ‘conversation’ with Bromley Historic Collections (Archives) in November 2017. 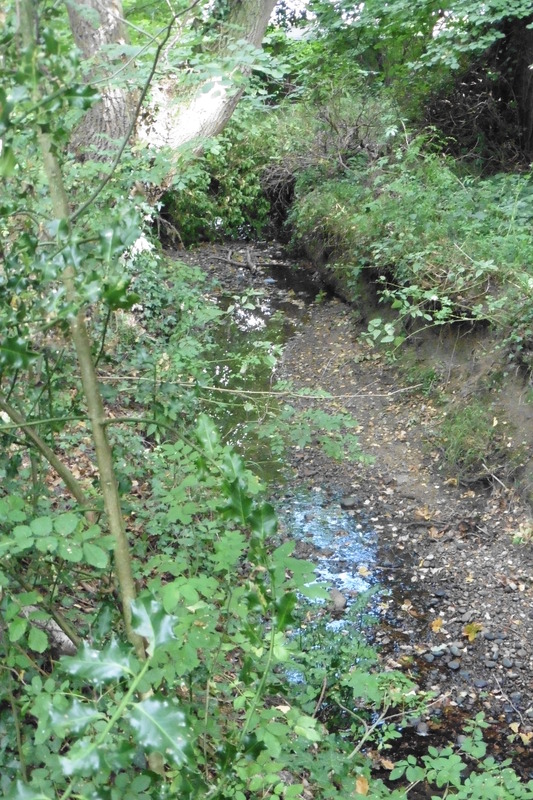 This entry was posted in Bromley History, Rivers and tagged Kyd Brook, Ninehams Wood, Petts Wood, Quaggy on October 21, 2016 by Paul B. Thank you for your excellent exploratory work and write up of your investigation of this mysterious region. That’s really fascinating! 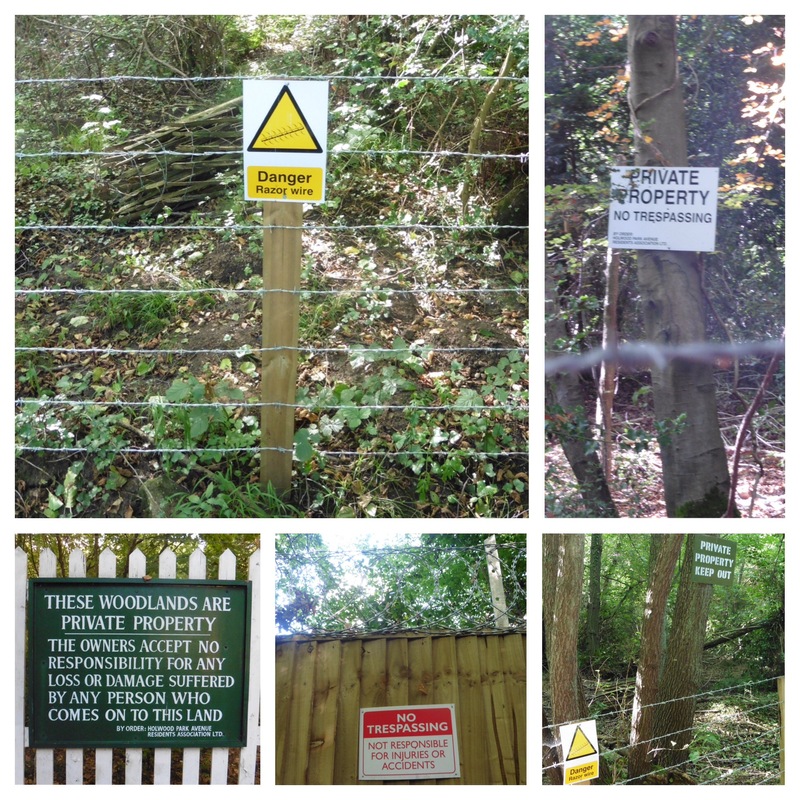 I am not surprised – the whole area seems to be covered (or at least used to be) by small streams, ponds and springs and three catchments – the Cray, the Quaggy and the Ravensbourne. I have e mailed Bromley Archives to see if they can throw any light on the exact location and/or the Act of Parliament. I have investigated the pump and it was next to Brook house ( now there is a clue ! ) on the A21, there is a small triangle of grass next to Brook house and that’s where the pump was, horse n carts used to stop for water for the horses. the other offshoot from Darrick wood has all dried up but can be seen if you go into Broadwater Gardens and the first bit field on your left there is a culvert behind the end house, I would post pics, but I cant see how ! Thanks – that’s really helpful & makes sense, I will have a look, although it probably won’t be for a few months. I think you mean Bassetts Way in Locksbottom? I do indeed – thanks for correcting me! Surprised it has taken so long for someone to tell me!